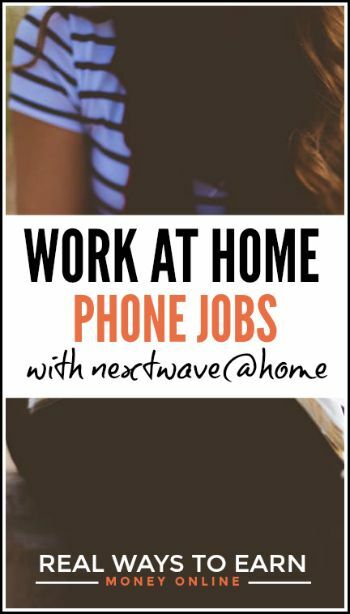 Work at Home for Next Wave Advocacy – Weekly Pay! Published May 22, 2012 By Anna T. This post may contain affiliate links. Regardless, I only recommend sites I've researched and/or used and trust. You may remember that a few months back, I posted a review of Onpoint Advocacy. Well, Next Wave Advocacy is a similar company. This is a work from home phone job, but it doesn't involve sales although it is all outbound calling. According to Next Wave, you'll be calling people across the country to discuss political issues. When you find supporters, you'll help get them involved in the policy making process. This means asking appropriate questions to understand their positions on the issues and determining their preferred methods of communication. You'll also help them submit letters to their political representatives, op-eds to their local newspapers, or to spread the word online. How much does Next Wave Advocacy pay? Currently the pay is $12 an hour for the phone work. When you work 20 or more hours each pay period, you will be paid an additional fee of $2.00 per hour, bringing your rate to $14.00. Additional fees are offered on all projects based on performance. These typically range from $1.00 to $5.00 per hour, bringing the total potential fee range from $15.00 to $20.00 per hour. You'll be paid every week and you can choose direct deposit if that works better for you. You work for Next Wave as an IC (independent contractor). This is what's great about this company — the hours are very flexible. Much more flexible than what you'll see with other work at home phone jobs. You have to put in a minimum of 20 hours a week, but you can work these hours around your own schedule. As long as you put in this much time per week, you can work at any time during the day (although I'm assuming not in the middle of the night or anything because you don't want to be calling people, waking them up). They are all listed here (including the tech requirements), but basically they want outgoing, motivated people who have basic computer skills. They will train you before you start working so you know exactly what you need to do. You don't use a cell phone or a landline. If you're hired, Next Wave will let you download their software program to make the calls through while you're online. You will need high-speed internet and also a work from home headset. This will depend. This company lets you work on different projects, and the projects don't all last for a set length of time. Some projects might last a few weeks while others might last a few months. But, the good thing is that you can work on more than one project at a time if your schedule will allow for it. So be sure you have a back-up source of income in place if you get put on a project and the project ends without another one for you to join. What other positions are there at Next Wave Advocacy? If talking on the phone just isn't for you, but you do like to write, you can also apply to be a freelance writer for Next Wave. From what I can gather, this mostly involves writing letters to government officials, citizens, etc. about current events/news going on. You can read all about the writing positions at Next Wave here. Want to go ahead and apply for the phone work? Go here to fill out your application (you will need a resume).